Melt caramels with milk in small bowl in microwave on HIGH for 2 minutes. Stir in pecans; pour HALF of the mixture over crust. Refrigerate crust for 10 minutes. Refrigerate remaining mixture for the topping. Mix cream cheese, sugar and vanilla with electric mixer on medium speed until well blended. Add beaten eggs and blend. 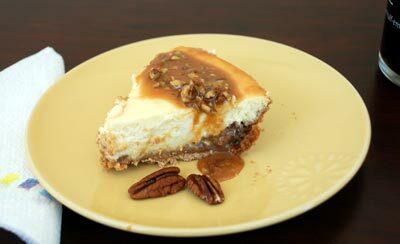 Pour cream cheese batter over caramel mixture in crust. Bake at 350 degrees F for 40 minutes or until center is almost set. Cool. Refrigerate at least 3 hours before serving. Drizzle reserved topping over each slice.